"I can't remember if I had my first drink to celebrate my good fortune or to grieve my losses. I figure if I sit here long enough, I'll remember. How can a guy who has nothin' lose everything?" Let me start my review by stating that I think Michael Rooker is an extremely underrated actor and I had high hopes for this film, although I had never heard of prior to it showing up in my mailbox. Let me also state that my hopes were dashed within the opening few minutes. This film is an adaptation of the James Ellroy (L.A. Confidential) novel of the same name. 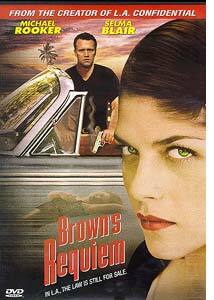 It is the story of Fritz Brown, a former cop with a drinking problem who now runs his own detective agency—when he's not busy repossessing cars. When a strange client with a pocket full of cash brings him a case, he throws caution to the wind and jumps right in, but he has no idea what he is in for. Sound familiar? Thought so. This isn't a horrible movie, but where Brian Helgeland was able to succeed with his L.A. Confidential script, Jason Freeland (who also directed) just couldn't pull this one off. This movie just doesn't work for me. First of all, there were too many clichés flying around. The former cop turned P.I., the former cop with a drinking problem, the former cop with a grudge for the Internal Affairs guy who ran him off the force, the motel room full of golf balls. Okay, maybe that last one was a bit original. The other major problem I had with this movie involved the pacing. It seriously took me three nights just to get through it. There are times when it moves so slowly I thought I would die, while on the other extreme plotpoints are just thrown at you from nowhere. The script is lacking in substance, and unable to keep me interested in the characters. Add to all of that a score that succeeded only in putting me to sleep and there you have it. Image Transfer Review: The transfer is a non-anamorphic 2.35:1 widescreen presentation and not all that bad. Colors were well represented with no visible edge enhancement or artifacting. Flesh tones seemed realistic as well. There was some shimmering that I noticed in a few places and some of the scenes seemed a bit dark, but other than that, a pretty good transfer. Audio Transfer Review: The audio on this disc in no way matches the video. The soundtrack is presented in Dolby Digital stereo. I'm not complaining about the lack of surrounds, they wouldn't have really been necessary in this film anyway. What I am complaining about is the fact that a large part of the soundtrack seemed muffled and distant. Michael Rooker has one of those voices that is not always easy to understand and this soundtrack does not help at all. Add to that the lack of English subtitles and the lackluster score and we have very poor audio on this disc. Extras Review: The only real extra on this disc is the commentary by director Jason Freeland and Michael Rooker. After struggling through the film, I was almost afraid to listen to the commentary. I will tell you that I enjoyed it much more than the film itself. Jason and Michael are both very interesting people to listen to and they seem to get along very well. They offer a lot of input on the making of the movie, the adaptation of the script and just some funny anecdotes from during filming. This is a thoroughly enjoyable commentary. The only other extras are the cast and crew biographies and filmographies and a trailer. The trailer is presented in DD 2.0, full frame. The menu was very easy to navigate and featured video clips for the scene access. One problem I had was when I tried to turn the commentary off. I ended up having to eject the disc and start from scratch. Lastly, I would like to point out my frustration with the lack of English subtitles! Only Spanish subtitles are offered. Argh. Oh, one last complaint. It took me well over five minutes to get the disc out of the keep case and I came very close to snapping it in half. Like I said above, this movie didn't work for me. If you are a fan of Michael Rooker, give it a spin, even if it is just for the commentary. If you like this movie already, then I would definitely recommend getting it for the commentary alone.